AQUARIUS is the eleventh sign of the zodiac and is ruled by the planet Saturn. This is a sign of brotherhood and friendship. AQUARIANS are unorthodox, original people who refuse to follow the crowd. With AQUARIANS, what you see is what you get…they do not put on facades or affectations. Intellectual independence is their most marked characteristic. In the sign of AQUARIUS, the combination of a fixed quality (representing persistence) and an air element (representing intellect and communication) under the influence of the planet of change, Saturn, creates a personality that is liberal, progressive, yet fixed in opinion. People born under this sign are freethinking and unconventional. They will fight avidly for the rights of others. AQUARIANS have great desire for material gain, but are not greedy. They are tireless workers and are willing to work for what they want, and do not demand more than their fair share. Because they take their work seriously, they can be a bundle of nerves inside, but to outward appearances, they seem to be calm. An AQUARIAN will hatch up a grandiose scheme for improving the way things are, but their main interest is in creating the idea, not translating it into action through work. Hard work doesn’t interest them unless the rewards are truly beneficial for everyone. AQUARIANS are creative, imaginative, endlessly willing to experiment, but the drudgery of detail and the minutiae of management are not their style. AQUARIANS live most intensely in their minds. They are a seeker of knowledge, rational, open-minded, gifted with breadth of vision. AQUARIANS can be objective in judgment, for they don’t let emotion get in the way. This appears to give them the ability to stand outside of themselves, to rise above ordinary human frailty. Their built-in distrust of emotion compels them to struggle against its chains, and this may become a source of inner conflict. As an idealist AQUARIANS would like to see that everybody is happy and their ambition is to do something important and meaningful. Many AQUARIANS go into politics or become involved in social causes. Whatever their political persuasions, however, they’ve been given special gifts for rallying the masses. As symbolized by the human Waterbearer, they bring a refreshing, positive message of community, of hope, and of progress. As the Fixed sign of the Airy creatures, they don’t just talk about ideas. They will do something with their ideas, especially when they can serve mankind. This is the astrological sign of the future, of the visionary, of hopes and wishes; they are the kind who follows a dream. The AQUARIUS lover is full of surprises. They simply cannot be happy or fulfilled unless they are free to do as they like. No matter how deeply in love an AQUARIUS may be, they are never willing to sacrifice their autonomy, but they always put honesty ahead of romance. The AQUARIUS friend tends to collect friends the way some people put together an eclectic art collection. The typical AQUARIAN may have so many friends, but very few confidants. Some AQUARIANS may use this as a way to maintain emotional distance. In general, AQUARIUS likes a friend who has intellectual interests and enjoys the unusual and the radical. 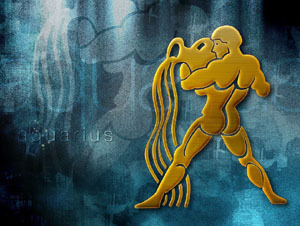 AQUARIUS will be friendly toward anyone and will tend to regard any relationship as platonic.